Looking for a Supplier of Wholesale Tanzanite, America’s Favorite Gem? “Tanzanite” which comes under the “Zeosite” category, is a purple blue gemstone and that has the optical phenomenon of Pleochroism which means It shows a different appearance of color from different sides and different level of lights give it a striking look. The blue color of this stone is so fascinating that it replaced Blue Sapphire in some jewelry designs. As mentioned above that it shares the pleochorism property is why cutting of the stone plays a vital role in the market value of the Tanzanite, and the real challenge is to cut the stone in a way that it shows the most pleasant color through the crown part and another challenge is to make sure that it is cut as minimally as possible because carat size matters a lot in this stone. When we talk about treatment, all Tanzanite Gemstones are normally heated, which is acceptable and understood in the market. 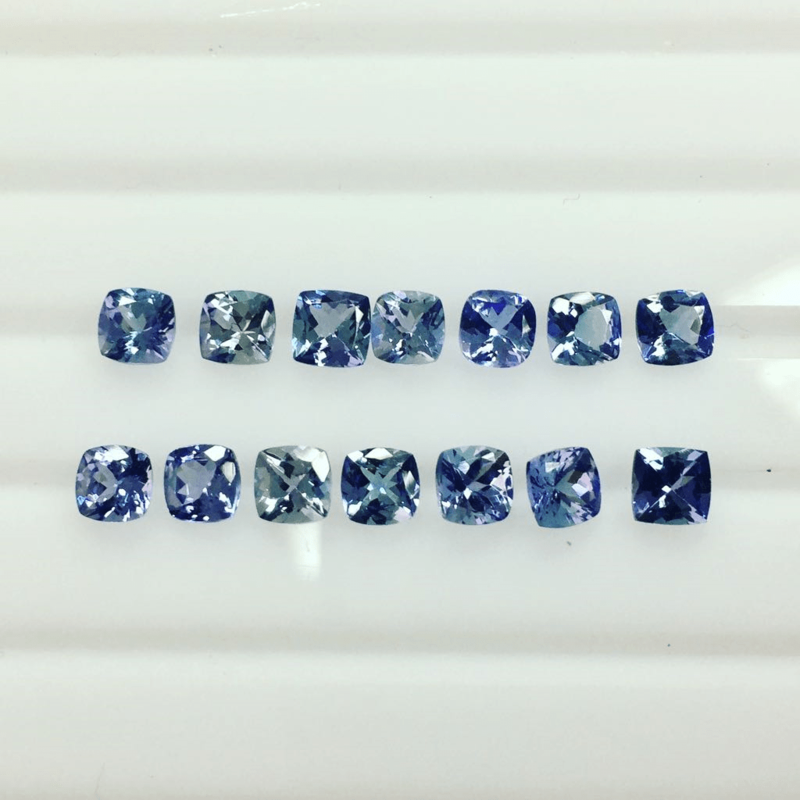 Our own factories are located in Thailand & India, producing High Quality and Medium Quality Wholesale Tanzanite Cut and Wholesale Tanzanite Cabochons. We specialize in both cut and cabochons. The Chemical Formula of Tanzanite is Ca2Al2(SiO4)3(OH) ( Calcium aluminum silicate ) and comes with an orthorhombic crystal structure and 6.5 to 7 hardness on the MOHS scale and has 3.35 density. The luster and transparency level is also good in Tanzanite Gemstone which comes with a 1.691 to 1.700 refractive index. It comes with a purple hue with the primary blue color. Tanzanite is a blue colored, Semi Precious Gemstone that has been used since quite long ago. It has a dark pleasant blue color pleases customers worldwide, especially the Americans. Our factories produce everything in calibration sizes, be it small or medium sizes and in almost all shapes for Cabochons and Cut. However in Cabochon, Ovals are the most common and the most available shape, because of the rough structure. We guarantee to provide Wholesale Tanzanite Prices, to our customers, even if its a few pieces ordered, or a large order. Please get in touch with us instantly if you want a consistent supply of Tanzanite, at Wholesale prices, because India is a hub for 60-70% of the production of Tanzanite. There are other businesses listed as Supplier of Wholesale Tanzanite, but Communication, Quality Control, and Punctuality is what they will lack. Navneet Gems & Minerals is the right supplier and right Wholesaler of Tanzanite. We have stocks available in all qualities. Once a sample is presented, or target price quoted, we can work on a continuous order basis. In 1967, a Masai Tirbesman found the vivid blue and transparent crystals in North Tanzania (East Africa) and later on he informed his local people there and claimed and registered new mines there. It was mistaken as Sapphire in the beginning because of the same intense blue color. In the next few months this news spread to nearby areas and more than a hundred claims were registered in the area. Soon this news aired in gemological circles and gemologist started to study the mineral, chemical structure and composition of this stone and they found that it was a combination of Al, Calcium and Sio2 with hardness of 6.5-7 on MOHS scale. The interesting thing is that the demand graph of this stone increased rapidly. It was Tiffany and Co. who took the first step to promote this stone in the market by the name of Tanzanite because it was discovered in Tanzania and they marketed this stone as a replacement of Blue Sapphire and as “Africa’s Mystery”. Tanzanite is America’s pride, it is the American Dream. But dreams do come true and that’s what’s happening around this country of America, dreams are coming true. 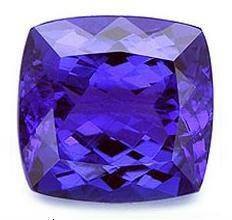 Tanzanite is one of the loveliest gemstone in todays market. Facetted stones are the most commonly bought and thus produced type of cutting style. With not too much room to play around with the creativity in this highly valued stone, the most common shapes are just Ovals, Rounds, Pears, Octagons, Hearts, Marquises. But Ovals really stand out at the top of the pyramid. We have a great supply of Tanzanite Facetted Gemstones. Here are some of the pieces from our stocklist. If any of you are interested in sourcing freesize stones from us, simply contact us at navneet(at)navneetgems.com. Just like other stones, the 4c’s (color, clarity, carat and cut) play an important role in the price of this stone. The bigger and more vivid blue stones are higher in price. A manufacturer makes a decision based on market price, whether to cut considering size or face-up color. You can understand the clarity very easily by seeing a normal quality Tanzanite Cabochon and Tanzanite Cut Stone because normally cabochons come in unclear quality in comparison to cut stones. A nice quality tz stone must be cloud free and crack free with good transparency and color saturation. Here is general Color Chart of Tanzanite and you can easily ask the price from us based on your desired color. A gem quality Tanzanite is an intense violet-blue all over the stone with perfect saturation of color. Another price factor is shape and ovals, rounds, cushions and octagons are much more valued than marquise, trillion and square. Who we are? What we supply? What you can expect from us? Every buyer who is going to spend his precious money always wants a gemstone supplier who can consistently supply desired quality products at competitive wholesale prices and we do. We are Navneet Gems, wholesale manufacturer and supplier of loose Tanzanite Gems. We have our own factories in Bangkok, Thailand for Tanzanite, Tourmaline, Ruby, Sapphire and Emerald and all Semi Precious gemstones which we are cutting in Jaipur, India. We supply different qualities in Tanzanite stones (A, AA, AAA and Gem Quality) and you can call us a “one stop shop” for retailers, wholesalers, designers and stores. We have our nice sources for rough material and in all small to big sizes. When you buy online gemstones then you look for the same quality and color and clarity for what you are paying and you can expect that from us. Our company has been working in the gemstones field for the last 18 years and served very many customers from different countries. The price parameters of Tanzanite, are just like Precious Stones and there are different markets for calibrated, big size, top quality stones. How calibrated and low quality Tanzanite came into the market soon now you will understand by reading an interesting story behind Tanzanite. There is an interesting graph between demand & supply, prices & supply of this stone. In the very beginning when Tiffany and Co. started to promote this stone to big jewelry companies as a replacement for Blue Sapphire, supply was available in big quantities but demand was low. Later this stone became very popular and the Tanzanian government took the supply and mines under their control and the supply became low and low supply raised the prices of available material in the market. By seeing the skyrocketing prices, big companies stopped using this stone in their designs. After 10 years, the Tanzanite story took a new turn when thousands of independent suppliers took over it and low supply became oversupply and both calibrated sizes and big sizes were available in big quantities in market, so prices came down and later on the Tanzanian government released some strict rules and supply of this stone become limited again and now prices are increasing day by day. 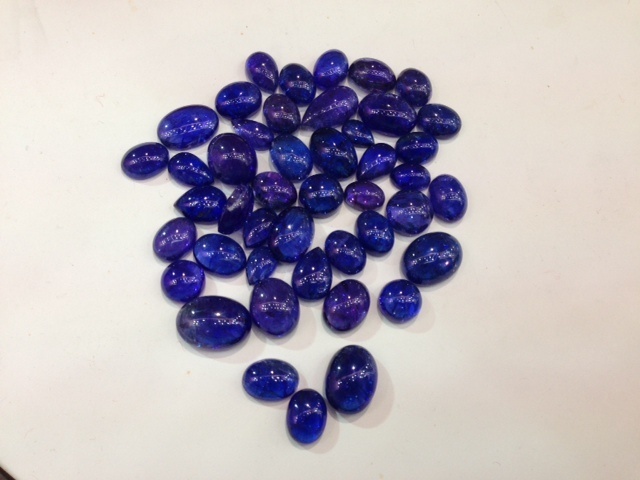 Tanzanite Cabochons are really very famous for their prices. I mean Americans love Tanzanite and since the early 21st century it really took off. But recently since the general quality has started to go down, Tanzanite Cabochons have also like other cabochons become very trendy. Tanzanite cabs are un-replaceable. Nothing can really beat them in terms of Tanzanite’s color and quality. Can you think of a different stone other than Tanzanite which comes in the same quality, color and properties of Tanzanite? The answer is probably no. Generally not the most preferred quality of Tanzanite Cabochons, here in the picture. But when it comes to the price point of view, the price is way less in the lots above. 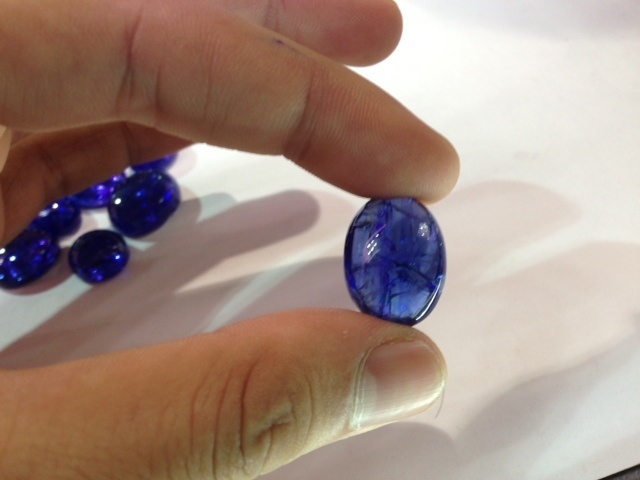 Most of the Tanzanites we have right now are in 2 qualities depending on what price range the customer is looking for. Can you see that the Tanzanite lots usually have Purples and the Blues mixed together? Just try looking for the Tanzanite pieces that look quite purplish and on the other hand the ones that have just a blue tone ONLY to them. We sell Cabochons in calibrated too but are less common due to its small price difference between these and the Facetted Rounds. But due to our huge inventory in Tanzanites it just becomes easier for the customers to select what they like, according to how much they are willing to spend on each item. Navneet Gems & Minerals is a leading supplier of Wholesale Tanzanite, and we have grown since the past 5 years incredibly, because we source our gemstones straight from Tanzania, the only place where mining for Wholesale Tanzanite takes place. Want to buy Loose Tanzanite Gems? Send us an inquiry right now with your requirements and we will get back to you within hours. © 1987-2014 Navneetgems.com all rights reserved.